My Granny regularly made Homemade Egg Noodles and they were always my favorite. Homemade Egg Noodles were one of the first things I learned how to make after Colt and I loved in together, and are still a staple. It seemed like once every few weeks Granny would make pasta and hang it from the chandelier in the dining area with coat hangers to dry while I was growing up. I remember watching her roll the dough with a hand cranked pasta maker and begging for her to let me help. We never had boxed pasta other then spaghetti and macaroni. Chicken soup and casseroles where always filled with delicious homemade noodles. To this day when I have tried to make a casserole with boxed noodles I never enjoy it. I know I'm a noodle snob I was so spoiled it makes somethings hard to settle for. Every so often my husband throws in tuna casserole when I ask him for a few dinner idea's. I then try to redirect his attention as hand kneading dough isn't my things usually. Who has time to spend 20 minutes kneading? Not me. But tuna casserole with regular egg noodles yuck! So one day I thought why not use the kitchen aid to knead the dough like bread but on 2 so it's a bit more gentle and voilà no more kneading! Now only to go buy a hand cranked pasta roller and I will be 1 happy camper! To a stand mixer bowl and mix. Use a fork to blend eggs. Place in mixer dough hook and turn on 2. Keep going almost to next step. If the dough is looking like this add water a tablespoon at a time until it pulls away, kneading for 1 minute between additions of water. Up to a 1/4 of a cup water. Be careful not to use too much water or you will have a sticky mess. 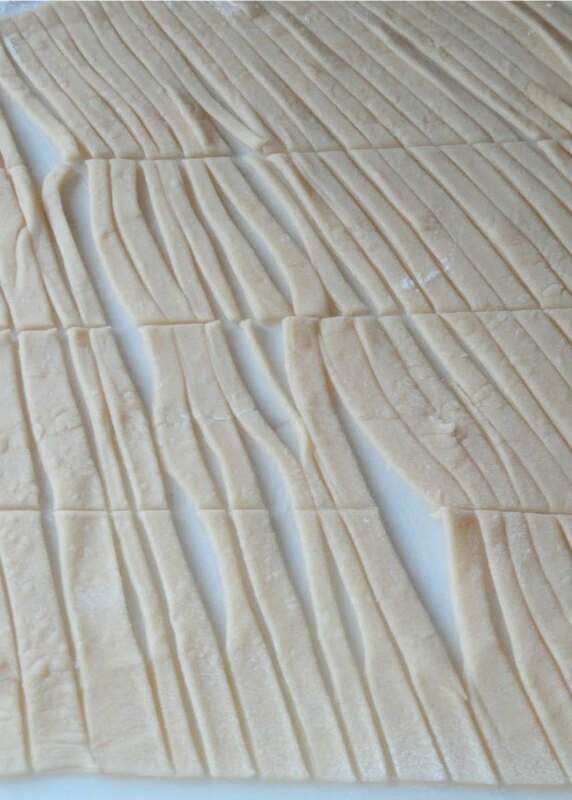 Dough will look like this rough and pulled away from the sides but firm. This allows the gluten to develop. The dough is now ready to be covered with plastic wrap or a bowl over the top to keep moist. Let rest 35 minutes﻿. After 35 minutes you should have a nice workable dough, that is smooth, and firm. Divide into fours on a floured work surface. Roll the dough out to desired thickness on a floured work surface. I like mine as thin as the dough will allow, but still be workable. I find stretching by hand and rolling a bit of the dough over the rolling pin and pulling helps. Also if you have a nice surface where the dough won't stick use flour lightly, so there is still some traction from the surface to help stretch the dough. Have patience the dough will try to shrink back, but eventually you will win the battle of the dough. Dough rolled out and ready to cut. Make sure under dough has enough flour to keep from sticking when cut. The finished noodles cut to desired size and thickness. I find a knife works best as a pizza cutter is harder to control making straight lines. Allow to rest a minimum of an hour on the counter before cooking. Boil in salted water, stock or soup for 4 minutes. Test doneness by tasting. Homemade Egg Noodles recipe with 5 ingredients is just like Granny would make from Serena Bakes Simply From Scratch. Place flour, and salt in a stand mixer. Stir together using a fork. Make a well in the center, add eggs, and olive oil. Mix eggs using a fork until whites have been thoroughly blended in. Use dough hook in stand mixer, and turn onto 2 or medium-low. If the dough is still quite dry after 6 minutes of kneading you can add a tablespoon of water at a time. Kneading for at least a minute between additions, as to not add too much water or you will have a sticky mess. At this point the dough will be rough on the surface but has pulled away from bowl around the dough hook and is firm. Knead dough for another 10 minutes or until smooth. This helps the gluten to develop. Cover and allow dough to rest for 35 minutes. Divide dough into 4's on a floured work surface. Roll each portion of dough on a floured work surface. Roll part of the dough over the rolling pin and pull till desired thickness is reached. Make sure under the sheet of dough has enough flour to keep from sticking to work surface when cut. Then use a large sharp knife to cut pasta to desired thickness and size. Allow to dry at least 1 hour I lay mine on a few cookie sheets with some flour to keep from sticking as I use mine the same day, but if you like you can hang them from hangers and allow to dry overnight for use later like my Granny would. Cook pasta in salted boiling water, stock, or soup. For approximately 4 minutes or until tender. Test doneness by tasting. Or store in a freezer until ready to use.